Dandelion smoothie, Chickweed salad, Pigweed pie and Stinging Nettle curry might sound like the lunch menu of the wicked witch of the west, but all these dishes are in fact incredibly nutritious, deliciously tasty and the ingredients can be found growing on the side of the road. 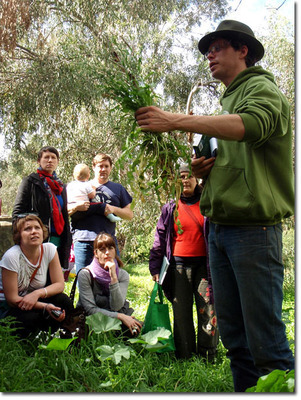 In fact most common urban weed species of Melbourne are edible and can provide valuable and nutritious fresh food. Join Adam Grubb on an Edible Weed Walk to enjoy these often called 'pests' as tasty meals, herbal remedies and compost additives. Start the tour with a taste of the dandelion smoothie before delving into recipes for cold-sore ointment from nightshade, Amaranth pancakes, Sticky Weed coffee substitute and many more. The two hour walk meanders along Merri Creek before ending up at CERES in time for what may be the most delicious egg rolls in existence. Worth it for the expression on your friend's faces as you whip a weed out of the ground and start munching. It's amazing that so much of what we see as weeds is edible! I went on an indigenous tour when I was in Cairns, and our tour guide picked things off bushes, eating flowers, and digging up bulbs. It was quite incredible!